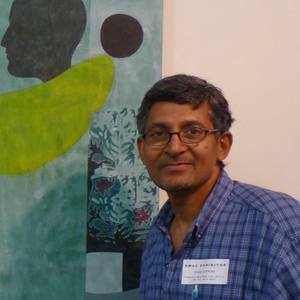 I am a Brooklyn, New York artist who was born and raised in Kerala State, South India. My earliest influences were the elaborate temple arts and colorful folk and religious rituals of my state. My interest in the visual arts led me to enter the theater arts program at the Kerala Kalamandalam (The Kerala State Academy of Arts). There I studied the intricate, built-up (almost sculptural) makeup and costume design for two, centuries old, dance-drama forms unique to Kerala. Kudiyattam (from the 10th century, considered to be the oldest, continuous theater form in the world) and Kathakali (established during the time of Shakespeare). Both art forms, tell stories from Hindu mythology. The residue of this rich artistic lineage of image and color still runs through my art.